The purpose of this textbook is to serve as reference for an introductory course in Sociology. The inclusion of family planning and other social issues provides background knowledge for an understanding of these, and other contemporary conditions. The book is likewise designed to facilitate the integral development of students for them to effect changes in the self as well as the environment thereby realizing the fullness of human life. 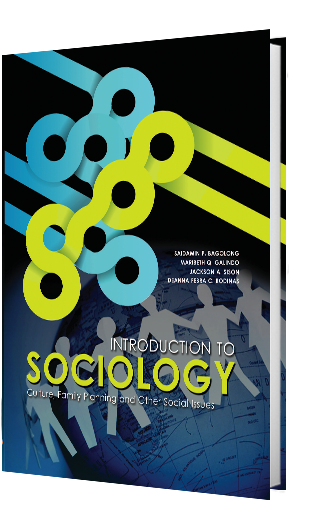 Even though this is an introductory textbook, we have deliberately retained many of the salient features of sociology as a young discipline. This is the reason why we incorporated many social issues to stimulate students’ curiosity about learning society, culture, family planning, gender, environment and eve indigenous people. 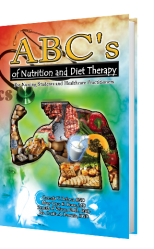 This textbook could not have been written without help from many people whose ideas we have borrowed, modified and incorporated. To them we are deeply indebted. Categories: Our Product, Sociology. Tags: College Books, Deanna Febra C. Rodinas, Jackson A. Sison, Maribeth Q. Galindo, Saidamin P. Bagolong, Sociology. To describe requirements of the Hotel and Restaurant Practicum Program. 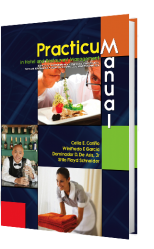 Additionally, this manual is meant to be used in conjunction with the over-all policies and guidelines of different hotels and restaurants in regard to their Practicum Program including requirements, important student policies, and academic policies of the school. There are many procedures, sequences of courses, deadlines, and academic requirements that students need to know so they may proceed smoothly through their practicum. Each student has an assigned advisor with whom she/he is expected to keep on-going consultation. The student is the one primarily responsible for knowing the information in this manual and keeping apprised of deadlines and on­going requirements and responsibilities. The Hotel and Restaurant Practicum experience is a major testing ground for the student's knowledge, skills, and values. The student is supported in this experience by the leadership of her/his practicum coordinator. The goals and activities presented are intended to provide helpful guidance and structure to aid in a successful practicum experience for the student and to the participating hospitality industry partners. Students' excellence in learning is improved through techniques, strategies, and innovation which are provided different types of practice of these skills in their course. Students also learn how technology has become part of the hospitality industry and the skills related to the use of technology in the different departments of the hotel and restaurant. The development of learning becomes a dynamic process based on theories, researches, best practices, and professional standards for HOSPITALITY INDUSTRY. This book is primarily intended for the undergraduate study in government and the 1987 Constitution. This, however, may very well serve as a handy reference not only to college students but also to every person interested in acquiring knowledge of the basic framework of our government. This book grew out from the lectures and notes made by the authors while teaching the course and/or while studying Law. 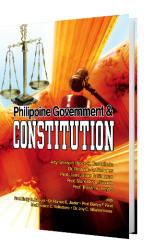 Said lectures and notes were later on consolidated into a book in the attempt to present to the readers a simplified but complete text in the study of Philippine Government and the 1987 Constitution. Varied activities were suggested alter each discussion to reinforce learning. These activities may also be employed as the professor's alternative assessment tools. It is hoped that these activities wilt make the study of this course more meaningful and interesting for the students. Tests were likewise provided after each chapter. The tests herein provided may be employed by the professor either as models for test construction, assignments For the students or evaluation instrument of how much the students mastered the objectives enumerated before each discussion. Should the professor decides to make use of the tests as tools for evaluating students' mastery, the authors suggest that the professor be not limited by the items provided as these tests are open for revisions depending on the emphasis made during the class discussions or on other factors that may warrant such professor's discretion. The authors extend their heartfelt thanks to their respective family, relatives, colleagues,, and friends for their unending support, love,, and inspiration.. The authors also like to extend their deepest gratitude to all persons who contributed to the realization of this work; and most of all to Almighty God for the gift of knowledge and for all His blessings. This humble work is dedicated to all those who share the authors' dream of great things for our beloved Country.